SCOAP3 – or in the dry longer form, The Sponsoring Consortium for Open Access Publishing in Particle Physics – brings together a global consortium of over 3000 research institutions across 44 countries and 3 inter-governmental organisations, to allow open and wide dissemination of final peer-reviewed research in High Energy Physics (HEP). To provide open and unrestricted access to all HEP research literature in its final, peer-reviewed form… [and] …centralize all OA expenses that will therefore not have to be directly borne by authors and research groups. Since 2014 the consortium has supported the publication of 20,000 Open Access articles, and in 2018 SCOAP3 has increased its coverage to 90% of HEP research outputs with the addition of three more journals added to the consortium. Articles can either be accessed in the SCOAP3 subject repository or on the publishers’ websites of the respective HEP journals. SCOAP3 essentially “flips” High Energy Physics journals to Gold Open Access. This is done by re-directing a proportion of funds which libraries would otherwise spend on HEP journal subscription costs, into making HEP research OA. 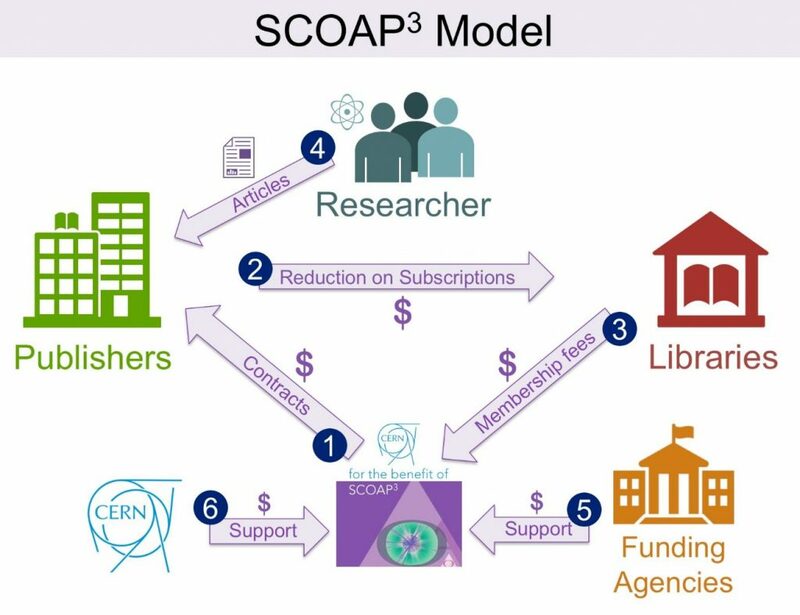 SCOAP3 call this the ’recirculation of funds’ business model: and it works on the principle of tripartite collaboration between the library community, national funding agencies and commercial and society publishers of high-quality HEP journals. CERN/SCOAP3 enter into contracts with a HEP journals publisher to fully or partially cover the content cost (dependent on the amount of HEP research published in the journal). In return, the publisher agrees to make all HEP article OA under a CC-BY Creative Commons license. Participating publishers then reduce or entirely eliminate the subscription costs for HEP journals, as articles are made OA. The saving made by the reduced subscription fees are then used to pay the SCOAP3 fees (almost like a membership fee). This is all done at no extra cost to the researcher, allowing researchers to publish OA when and where they like amongst the participating HEP journals, without any of the extra administrative work involved with publishing OA. In some countries, participating research agencies also contribute extra to the SCOAP3 fund, helping to fill funding gaps if libraries have no sufficient funds to redirect. CERN as a host organisation directly contributes from budgets to cover any shortfall, increasing the total volume of funds that can be used to make HEP research OA. The net result is a very large amount of research on High Energy Physics is made Open Access, and the cost is fairly spread out across a global participating consortium, SCOAP3. What do I need to do as a researcher in High Energy Physics? As a researcher publishing in any of these journals your HEP related work will automatically be made Open Access by the publisher. We would however request that you also deposit the published article into our own Kent Academic Repository, so your research complies with the University Kent Open Access policies for the post-2014 REF. Between 2014 and 2016, the SCOAP3 partnership disbursed a total 13.8 million Euros to publishers for making 13,368 articles Open Access. In 2018 the publisher American Physical Society (APS) joined SCOAP3.